This is creamy, tangy, and easy Homemade French Onion Dip comes together in 15 minutes. 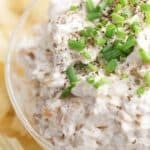 Don’t waste your time on processed store bought French Onion Dip when you can make it just as quickly as you can walk down the chip/dip aisle! Delicious, creamy, and comes together in only 15 minutes. 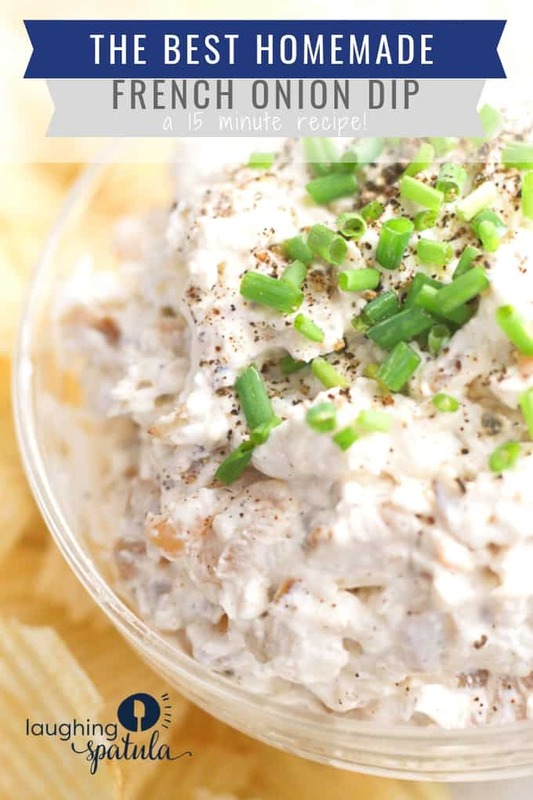 Recently I reconnected with some old girlfriends from high school- we get together and never shut up, but the one time there is quietness is when we have this Homemade French Onion Dip! 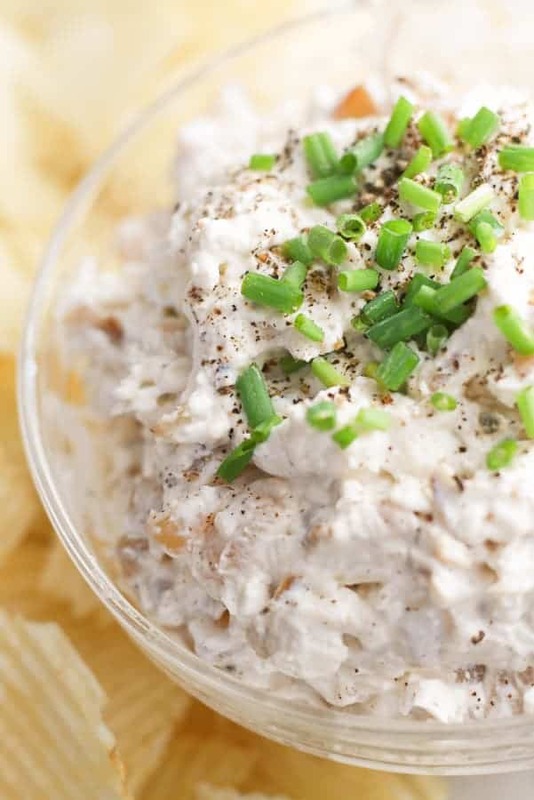 Dip some plain potato chips in it, or a spoon, or your finger…either way, Homemade French Onion Dip = Happiness! Start off this Homemade French Onion Dip by CHOPPING your onion; I repeat- CHOP. Don’t slice! Long stringy pieces of onion are super hard to eat and a choking hazard…I have enough anxiety as it is without worrying about my guests choking on a piece of stringy onion. Chop vs slice; This keeps you from choking on stringy onions! Add 1 tablespoon of butter plus your chopped onion to a pan, and caramelize. About 10 minutes on medium-high heat until rich in color. Let the warm onions soften your cream cheese for easy mixing! 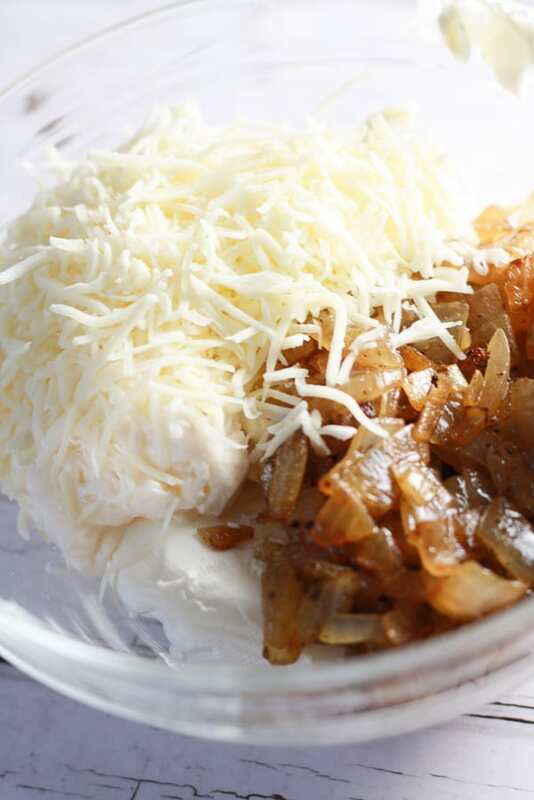 In a medium size bowl, combine cream cheese, mayo, and shredded smoked provolone with the onions. The warm onions will help loosen up the cream cheese. Mix well with a fork, and you got yourself some Homemade French Onion Dip! Delicious- serve at parties, use on sandwiches, straight out of the bowl-this stuff is multipurpose! I used a large white onion which yielded about 1.5 cups of chopped onion, but whatever you have on hand will work as well. 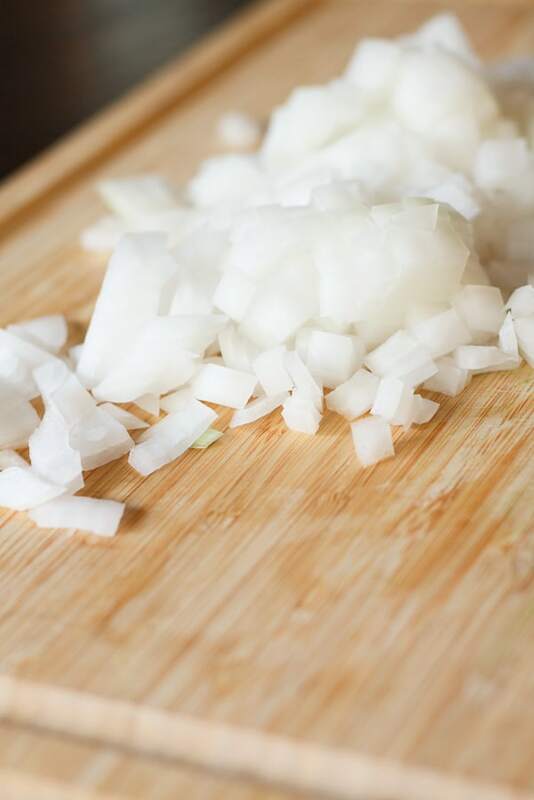 Don’t undercarmelize the onions; you won’t get the same flavor you’re looking for. Wait until the each piece of onion is brown, and almost candied. Just make sure your onions are brown, and not black- a little black is okay, just don’t burn them. If you’re trying to go low calorie– use greek yogurt in place of mayonnaise, and use low fat, whipped cream cheese in place of regular cream cheese. I used shredded smoked provolone; this gives it that delicious, smoky and oniony taste that French Onion Dip is known for. If you can’t find this at your grocery store, just opt for regular provolone or even shredded mozzarella. Did you make this onion dip?! Tag us on Instagram with #laughingspatula or @laughingspatula – we love to see your pics! Need other great appetizers? Check out this Avocado Hummus; Easy to make, and no guilt to snack on it. Want something carby-ier? Twice Baked Potato Bites– your guests will love you. Headed to your show-off Aunt Mildred’s house? This Butternut Squash and Goat Cheese Galette will make her stop talking about her mink coat collection! I’m off to go do some fitness- FITNESS’ ONION DIP INTO MY MOUTH. Get it? Dumb joke. 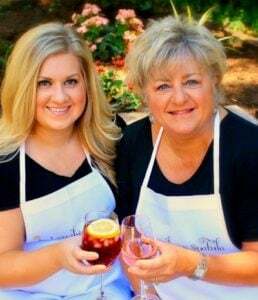 Onto the holiday season for fresh and easy recipes! An easy 15 minute appetizer recipe that will have your guests asking for more! In a medium size skillet, add chopped onion and butter. Sautee until caramelized. Let sit for 5-10 minutes to semi-cool. In a medium bowl, combine remaining ingredients, with onions on top of cream cheese to soften. Mix well. Garnish with chives if desired and serve with potato chips, vegetables, or flatbread. Don't undercarmelize the onions; you won't get the same flavor you're looking for. Wait until the each piece of onion is brown, and almost candied. Just make sure your onions are brown, and not black- a little black is okay, just don't burn them. If you're trying to go low calorie- use greek yogurt in place of mayonnaise, and use low fat, whipped cream cheese in place of regular cream cheese. 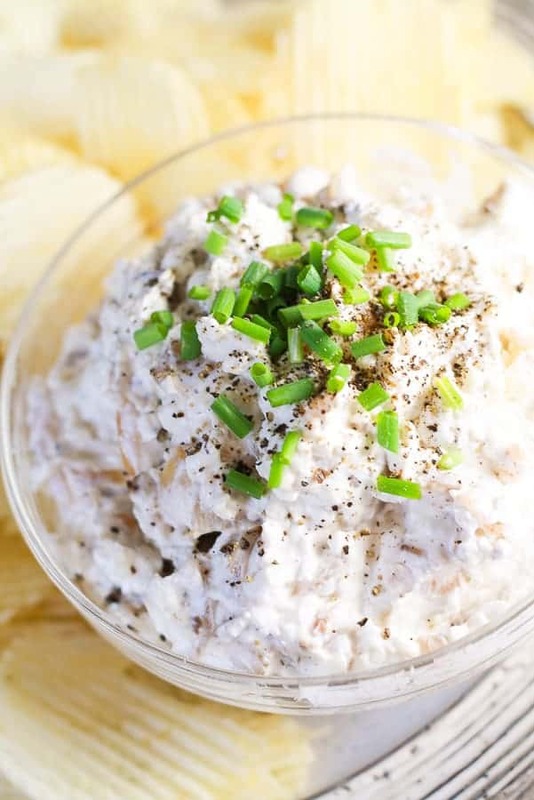 I used shredded smoked provolone; this gives it that delicious, smoky and oniony taste that French Onion Dip is known for. If you can't find this at your grocery store, just opt for shredded mozzarella. Did you make this onion dip?! Tag us on Instagram with #laughingspatula or @laughingspatula - we love to see your pics!